Captain Cook Cruises is back again this Whale watching season with four Whale Watching cruises operating daily from May 15th to November 28th, 2010. Book online at www.captaincook.com.au and receive 15% discount. 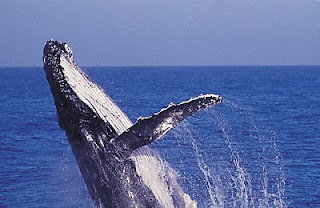 Captain Cook Cruises offers a whale guarantee. If a whale is not sighted during the cruise, passengers can cruise again for free. Or, if you cruise on a smaller vessel between June and August you'll receive 50% of your money back. Whale Watching cruises depart daily from Jetty 6 Circular Quay at 9.10am, 9.15am,1.15pm and 1.30pm and from Darling Harbour at 9.00am, 9.45am, 12.50pm and 1.15pm.